New home sales pulled back during August, one month following a surge in sales to their highest level in over 9 years. In each region, activity dropped across the country with the exception of the West. Sales of new homes were down 7.6% in August to an adjusted annualized rate of just over 609,000, said the Commerce Department in a report released on Monday. Those numbers followed a July surge in sales that saw a 13.8% spurt to over 659,000, which was the fastest new home sales pace since October of 2007. Following the surge in July, analysts expected sales to slow in August. Even with the decline in August, new home sales are still up a strong 20.1% from the same period one year ago. An analyst pointed to different positive factors that were helping the U.S. housing market. 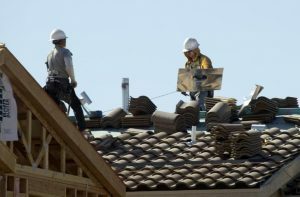 The analysts said confidence of the homebuilder is up and the increase in price has slowed, which was good news for homebuyers that are buying their first homes. Credit standards have eased as well and mortgage rates have remained low, said the analyst. The average price for a new home that was sold during August was $284,000 or 3.1% down from that of July and 5.3% less than the same month last year. One problem that has weighed on the housing industry is that are not enough homes up for sales both in the category of new homes as well as existing homes. Existing home sales dropped by 0.9% during August to a 5.33 million annual rate. At the sales pace for August, it would take over 4.6 months to end the current new home supply that is available. That is up from July’s rate of 4.2 months. Both months had low levels of inventory, even though new home construction accelerated for the majority of the year. Builders want to boost construction more but face rising costs of labor and land. By region, there were a fall in sales for August in Northeast of 34.3%, which was the most of any region. Sales for the South region fell by 12.3%, while in the Midwest region they were down by over 2.4%. The West was the only section of the U.S. that saw an increase in new home sales in August. The increase was 8%.